Bucko Branham celebrates a career-first win in the Modified division at Devil’s Bowl Speedway. WEST HAVEN – American-Canadian Tour stock car driver Joey Polewarczyk Jr. waited a full year to make up for a bitter defeat at Devil’s Bowl Speedway, but the wait paid off on Saturday, June 6, as the defending ACT champion took down the caution-free People’s United Bank 100. His victory was part of a four-division card that also saw Bucko Branham, Dylan Rabtoy, and Chris LaVair carry the checkered flag. Hudson, N.H., racer Polewarczyk – known by the nickname “Joey Pole” – lost what appeared to be a sure ACT victory at Devil’s Bowl in 2014, getting beaten by Brian Hoar on a restart with just eight laps remaining. On Saturday night, though, his drive to the win was not to be denied. Polewarczyk started seventh on the 26-car field and conserved his tires in the first half of the race as Wayne Helliwell Jr. of Dover, N.H., and Barre, Vt.’s Nick Sweet, each a three-time Devil’s Bowl winner, waged a see-saw battle for the lead. Polewarczyk sliced through traffic after the halfway mark and used lapped traffic and superior handling to make his way past Sweet on the inside lane during the non-stop race. He stalked Helliwell and then made the winning move on the outside at lap 75, driving away to a convincing victory. Behind Polewarczyk, Helliwell and Sweet continued their race-long fight; Sweet finally wrestled the runner-up position away with five laps remaining. Home track driver Josh Masterson of Bristol, Vt., had his best-ever ACT showing in fourth place, while Brad Babb won a late battle for fifth place with first-time ACT driver Dillon Moltz of Waterford, Conn. Emily Packard finished seventh, followed by Hoar, Kyle Welch, and Brandon Atkins. Three divisions from the weekly NASCAR Whelen All-American Series competed. 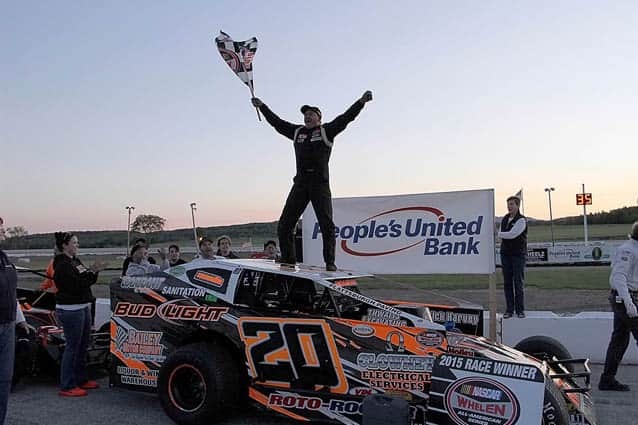 Bucko Branham of Plattsburgh, N.Y., turned around a rough start to his season with his first Devil’s Bowl victory in the 35-lap feature race for the Bond Auto Parts Modified division. Early carnage took out several cars before “Professor” Branham and Leon Gonyo made their way to the back bumper of leader Jason Bruno. Branham and Gonyo slipped by with 10 laps to go, and Branham’s No. 20 Bud Light-sponsored car sailed to the win. Gonyo, however, ran out of fuel on the final lap, allowing Bruno to take a career-best runner-up finish. Bruno, of Morrisonville, N.Y., was recently tabbed as a fill-in driver for the No. 69 McCoy Motorsports car and made the most of his opportunity by winning his qualifying heat and leading the first 24 laps of the feature. Rookie Jim “Timex” Morgan of Plattsburgh finished third in just his fifth career start, followed by Greg Atkins of Clintonville, N.Y., and Vince Quenneville Jr. of Brandon, Vt.,. Joey Roberts, Ron Proctor, Dave Snow, Jason Furman, and Codie Aubin completed the top 10; Gonyo was scored 14th. Atkins and Quenneville are locked in a battle for the first-ever Yandow/John Deere “Spring Championship Series” title, and will decide the winner at Airborne Park Speedway on Saturday, June 13. Atkins holds a miniscule one-point lead on Quenneville (242-241) entering the finale of the six-race series. 16-year-old Dylan Rabtoy of Swanton, Vt., was also a first-time winner on People’s United Bank Night, taking the 25-lap feature for the Brileya’s Chrysler-Jeep Renegade division. The second-generation driver started on the pole position and was never headed. Plattsburgh, NY’s Jason McClatchie finished second and was denied a “triple crown” after winning his qualifying heat and the semi-feature. Scott FitzGerald of West Rutland, Vt., held off a charging Richie Turner for third place, and Robert Gordon was fifth. Gordon holds a narrow five-point lead on McClatchie entering the final round of the Spring Championship Series at Airborne on June 13. Chris LaVair of Saranac Lake, N.Y., took down the 15-lap Portland Glass Mini Stock feature in a dominant run. The win was LaVair’s first of the year and the ninth of his career at Devil’s Bowl. Kris Clark of Keeseville, N.Y., finished second in just his second-ever visit to the track, while Spring Championship Series leader Dale O’Neil was third. Tyler Irwin and John McCarron were next in line. Devil’s Bowl Speedway will hold an open practice session on Friday, June 12 beginning at 4:00 p.m., followed by a barbeque party in the pit area at 7:00 p.m. Pit admission is $20 for practice, while both grandstand admission and the barbeque party are free. Weekly Friday night racing kicks off on June 19 at 7:30 p.m. with Central Vermont Motorcycles Night.